Mechanical engineers over the globe are increasingly ditching their metal counterparts in favour of an engineering wonder called Poly Tetra Fluoro Ethylene or PTFE. PTFE products are engineered plastics which offer a long term benefit in a variety of industries, which includes reduced downtime, improved performance and better resistance to nature. PTFE products can be manufactured not only in the form of rods, but also in the form of tubes, hoses and sheets. Heat Shrinkable: This PTFE product comes in a thin thickness wall and it serves a wide range of purposes which includes sheathing of wires and glass tubes, insulation of metal components, amongst others. The specialty of this hose is that its diameter tends to decrease when it is used to transfer hot air. Filled: This particular type of PTFE hose is a hose where the tube is filled with chemical additives such that it can support radioactive causes. This hose is used in those cases where there is a requirement of antistatic or abrasion properties to suit the needs of that specific type of business. Where application requires specific properties to be dominant, the PTFE tube is mixed with one or multiple fillers which enhance or suppress certain properties, improving the performance of the hose fittings. 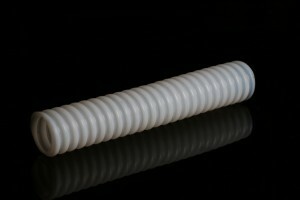 Corrugated or Convoluted: This particular type of PTFE hose comes with multiple folds on the exterior walls of the tube. This characteristic allows the tube to bend much more than what a normal tube would have, thus reducing the concerns of twists kinking during the time of moving the tube through tight angular positions where sharp bends are involved. Wear Resistance: A PTFE hose tends to provide a natural lubricity as against the normal metal which helps increase the wear resistance and the life of rollers, gears, seals and bearings. Temperature Resistance: A PTFE hose is known for its ability to resist not only high temperature but also low temperature. This ability helps bring down the cost associated with the loss of mechanical properties. Lightweight: A PTFE hose is known for being lightweight thus reducing the part weight by at least 30 % to a maximum of 50 % when used as a replacement to metallic parts. This feature helps save the save energy significantly if used in liner motion, transportation and material handling applications. 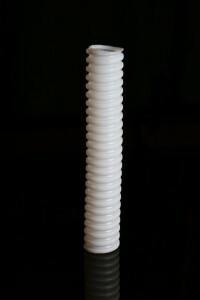 Shock Absorption and Impact Resistance Power: A PTFE hose has great shock absorption qualities and impact resistance. Fire Safety: A PTFE hose has greatly improved the fire safety in applications like transportation, aircraft, semiconductor, etc. The use of PTFE tubes in the semiconductor industry has hugely reduced the need of putting up those expensive fire-suppression systems. Insulation Properties: A PTFE hose is known to possess great insulation properties, which help improve the reliability of the product and helps reduce the heat. PTFE tubing is widely used in transportation and electrical industries to insulate the underneath product from electric and heat shocks. They also greatly help in insulating the product against high temperatures. Static Control: A PTFE hose possess anti-static qualities which prevent any sort of build-up of the electric charge. Corrosion Resistance: A PTFE hose is highly resistant to chemical corrosion. Besides, it has anti absorption properties, which make it highly resistant to water. Metals do not possess any such qualities and are easily vulnerable to corrosions from organic solvents, acids, and moisture. High Purity: A PTFE hose has helped immensely in the manufacturing of high-purity gas handling and fluid applications while reducing the concerns of leaching, out-gassing, and contamination. Due to such exclusive properties, PTFE tubings have a large number of industrial applications. PTFE products greatly help reduce the costs and are a boon to the industry wherever they find application. These PTFE products can be checked out on the following website http://www.aftubes.com/ along with the option of buying it at a great price.